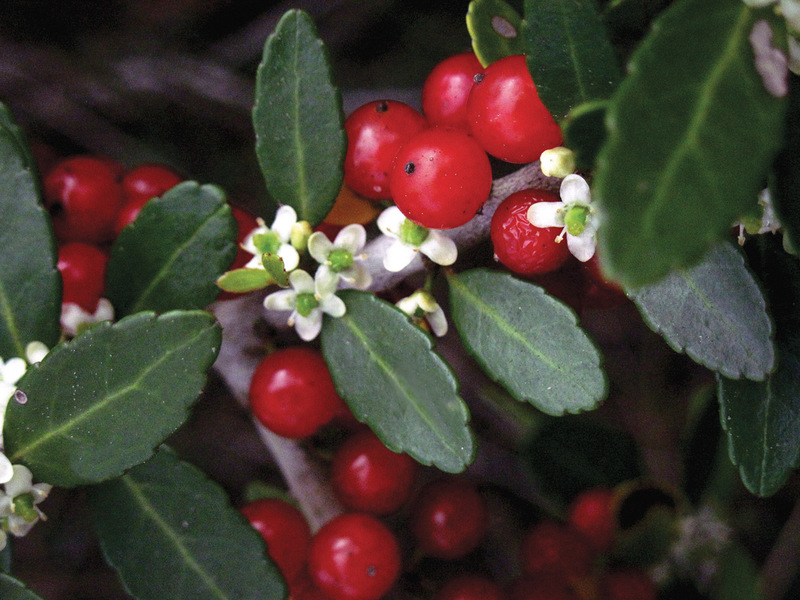 Flower Friday: Yaupon holly - Florida Wildflower Foundation – Yaupon Brothers American Tea Co.
Yaupon holly is a shrub or tree found in coastal and inland scrub, dunes, floodplains and hammocks. Its diminutive flowers bloom in spring, attracting a variety of bees and other insects. In the fall, abundant fruit production provides food for birds and small mammals. The dense evergreen foliage provides year-round cover for wildlife. Yaupon holly’s flowers are small, white and born in clusters within leaf axils. Simple leaves are oval to elliptic, dark green and typically less than 1 inch long. They are leathery with crenate margins and alternate arrangement. Fruits are small (about ¼-inch in diameter) green berriesthat turn bright red when mature. Branches are slender. Bark is smooth and whitish-gray. The crown is densely branched. Yaupon holly tea has been consumed for many centuries. For purification ceremonies, Native Americans brewed a strong “black drink” (as it was known by early settlers) that was thought to induce vomiting (hence the specific epithet vomitoria). Confederate soldiers used the tea as a substitute for coffee. In recent years, Yaupon holly tea has seen a revival and is now available commercially. The plant contains more caffeine than coffee or green tea, and is the only native North American species to contain caffeine. The leaves and stems may be used fresh, dried or roasted. To see where natural populations of Yaupon holly have been vouchered, visitflorida.plantatlas.usf.edu. Garden tips: Yaupon holly works well in a buffer or hedge or as a specimen plant. Its form is irregular, but it can be pruned to a desired shape or height. It is prone to suckering, so periodic removal of unwanted sprouts may be necessary. The plant is dioecious, which means both a male and female specimen are needed to ensure pollination and fruit. Berries are produced only on female plants. Yaupon holly is salt tolerant. Yaupon holly plants are available from nurseries that specialize in Florida native plants. Visit www.PlantRealFlorida.org to find a nursery in your area.